← The words ‘coming’ and ‘meet’ in 1 Thess. 4:15-17 – Pre Trib or Post Tribulation Rapture? 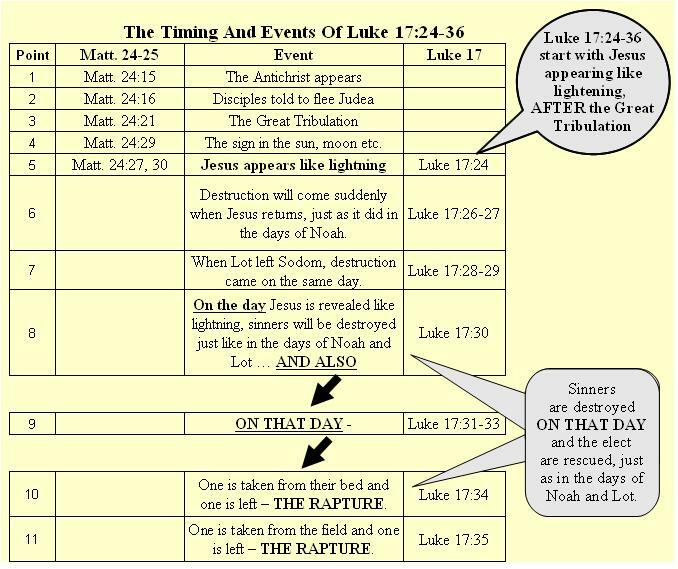 The following chart and text examine the verses in Luke 17:24-36 which are entirely about the day Jesus returns like lightning. I start with Matt. 24 to show the timing of the verses in Luke 17:24-36. Point 5 (Matt. 24:27, 30) says that Jesus will appear like lightning – Luke 17:24 is the parallel verse. Now let’s follow the verses in Luke 17 which describe Jesus’ return AFTER the Great Tribulation. Points 10 and 11 (Luke 17:34-35) say that “one will be taken and the other left” and this is the Rapture. So, AFTER the Great Tribulation, Jesus will return like lightning to rapture believers and to destroy sinners. 1) The Antichrist ………………………………… at Point 1. 2) The Great Tribulation ………………………… at Point 3. 3) Jesus appears like lightening …………………. at Point 5. 4) The Rapture and the Day Of The Lord ……….. at Points 8 to 11. Rescuing the righteous and then destroying the sinners was the pattern in the days of Noah and Lot and Jesus said, in Luke 17:30, that it would be the same when He returns. This entry was posted in All Blogs, End Times. Bookmark the permalink.